Traces of the two periods from which modern day Cirencester inherited its wealth and status are evident at one of the town’s oldest residential properties, for sale through estate agent Moore Allen & Innocent. 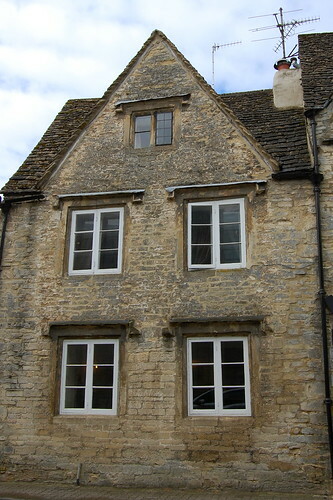 Number 7 Gloucester Street was built by a wealthy wool merchant in 1694, when Cirencester was the capital of Europe’s wool trade. But its historical features date back even further. Archaeologists in the town have a saying – scratch Cirencester, find Rome. And in the courtyard garden of the property is a Doric column from the time when Corinium was the administrative capital of Britain. As a plaque near the front door proclaims, it’s not without good reason that the property is Grade II* Listed for its historical importance. 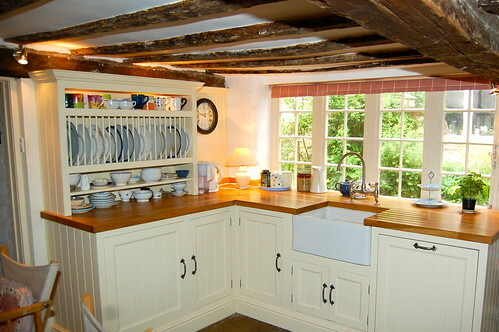 And the quirky cottage is jam packed with original features. 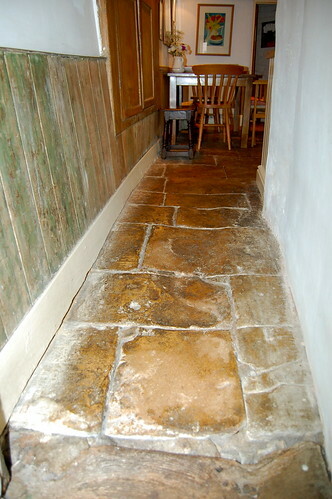 The flagstone floor between the living room and the kitchen have been worn by generations of tread. The living room has delightful window seats with wooden shutters in its stone mullion windows, while both rooms have large feature fireplaces. Wooden beams and foot-wide floorboards in dark oak can be found throughout the house, adding real character and a deep sense of history. The ground floor accommodation consists of a spacious living room, measuring over 15ft by 14ft, and an equally large kitchen – which has fitted Parlour Farm kitchen units and a Belfast sink – and a corridor leading to a bathroom. From the sitting room and kitchen oak staircases lead to the rooms from which the wool merchant would have plied his trade. The front room is now a spacious 16ft sq master bedroom. Two historical features have been deemed worthy of preservation – a plastered timber beam with a rose motif, and a fireplace with latticework effect to the back wall. On the other side of the landing is the dining room, where a door opening into thin air suggests a staircase and separate entrance that would have allowed the wool merchant to keep his home and business life separate. Adjoining the dining room is the second bedroom, a double with en suite facility. Up another flight of stairs a large landing and two double bedrooms with en suite have been created in the attic space. It is here that roughly hewn exposed wooden beams have the most visual impact. Outside is a courtyard garden, which catches the afternoon and early evening sun. 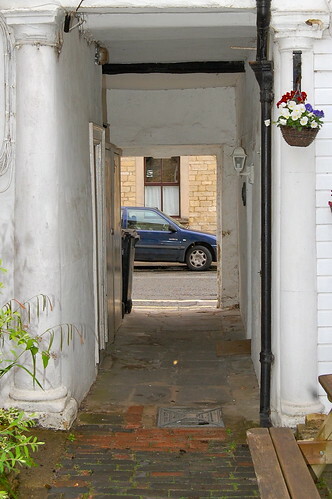 Set on flagstones, visitors to the house must pass through an archway, supported on one side by the ancient Doric column, to reach Gloucester Street, from where the market place is a peaceful five minutes’ stroll. The property is also close to Cirencester Park, ancestral seat of the Bathurst family, and fully accessible to the public.